Master bedroom offers a superb en suite wet room. Bedrooms 2 & 3 share a further wet room on the ground floor. All bathrooms have mirrors and under cupboard storage units. They are finished to a high standard with marble floors and walls. Spacious open plan living area with bench style dining table for 6, comfortable sofa area and coffee table, TV and DVD player with patio doors providing access to the pool area, outside sofa and additional dining. Beautiful open plan kitchen with modern units and black granite work tops. Fully equipped with everything you need if you want to cook including, fridge freezer, oven, hob, dishwasher, kettle, toaster, microwave, washing machine. Just returned from another fabulous 10 days in Kalkan, this time at the beautiful Elif Apartments. The Apartment itself was lovely, bright, spacious and very well appointed with everything you need for a relaxing holiday in the sun. The pool was great, large enough for a swim and cool enough to cool down after a long day spent in the sun. We have stayed in quite a few apartments/villas in Kalkan over the years and this was certainly one of the best. Thank you Kelly for letting us stay and hope we can return soon!! Thank you for your lovely review Nicola. We would be very happy to welcome you back to Elif anytime. Beautiful apartment, more like a villa! We had a lovely 2 weeks at Elif apartments. 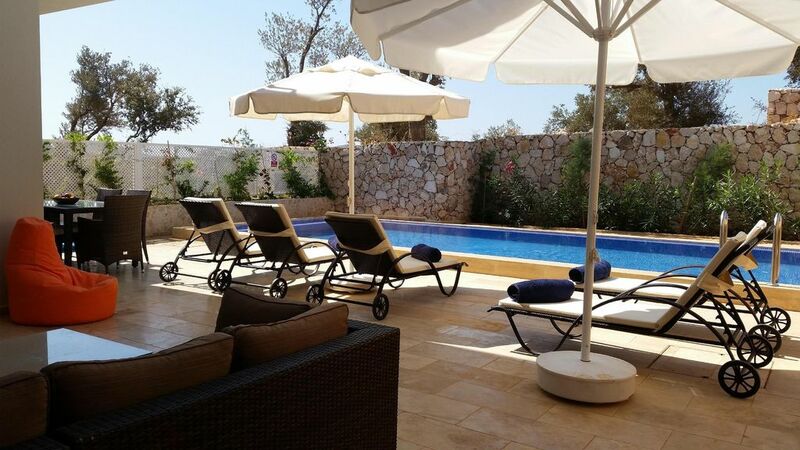 With a fantastic outdoor terrace and our own private pool, it felt like we were in a villa! The weather was really hot when we were there so the large pool was a welcome relief from the heat, as was the water cooler! Although Turkey isn't normally inclusive in UK mobile phone plans, nearly everyone there (restaurants, local contact, taxis) uses Whatsapp to communicate, which with WiFi made it easy and 'free'. We used Adem, the local contact, a few times to replenish the water, which was done really quickly. The kitchen is well equipped for eating in (which we did a few times) But equally there are many great restaurants in Kalkan which we ate at, our favourite was Mussakka. Although Kalkan is very 'hilly, taxis are cheap (around £2.50) and plentiful. The Thursday market, which is just down the road is also worth a visit, for all your 'Genuine Fake' goods! All in all a great holiday in a superb apartment. A lovely modern apartment with plenty of space indoors and outside. Just returned from a lovely holiday in Kalkan. Kelly’s apartment suited us perfectly being a family of 6, spacious inside and out with a lovely private pool. The pool and outside area were maintained daily during our stay. The apartment is clean, modern & surprisingly spacious. Walkable distance from the town and supermarket. Thank you, would definitely return. This was our fist trip to Kalkan and was also our first holiday away just the two of us. We chose this apartment based on the previous reviews and also the views in the photos and we was not disappointed. Kelly arranged the transfers from the airport for us and they were waiting with some water which was needed, The transfer time was about 1hr 30 plus a 15 minute stop at the cafe on route which was very nice. On arrival at the apartment there was a welcome pack in the fridge which we have never had before and this had all the items you needed to get you started. The apartment was very clean and well laid out and the pool was just perfect. Kalkan town was very nice and there is some very nice restaurants and it seems that the whole area has not been spoiled still yet very traditional food. The walk down and up from the town is not for the faint hearted but was nice after a nice meal to walk off some of the food and drink. Spacious, well equipped, clean, well located and very comfortable! which is an excellent supermarket, 10 mins to the town and 15 to the harbour. We always walked in and got a taxi back, which are still very good value. Kelly was friendly and helpful with our booking and always replied promptly to us. She kindly arranged our airport transfers which went smoothly and the drivers were very good. Adem (local maintenance team) was very efficient and sorted out any queries quickly also arranging for fresh drinking water to be delivered when we ran out. Thank you Kelly, we loved your apartment, can highly recommend it and hope to stay again on a future visit. The apartment is superb with everything to a very high standard and everything you could want and need on holiday. The town of Kalkan is unlike other places we have been to in Turkey, much less fake hussle and busel and much more high quality restaurants all with there own take on Turkish food. We ate in 6 different retaurants any one you would be pleased to return to. Kalkan town beach is 10 minutes walk away. There are 5 beach clubs in the area. These offer water sports, sun loungers and umbrellas, showers and excellent bar/ restaurant facilities. Patara beach is a 15 minutes bus ride away and famous for its 18kms of unbroken sand and clear warm water. Kaputas is a small but beautiful beach and is a 10 minute bus ride away. Dalaman is the preferred airport and is around 90 minutes away. Thomas Cook, Thomson, Easy Jet, Jet 2 and Monarch all fly into Dalaman. Airport transfers or car hire can be arranged at an additional cost and usually paid direct to the company providing the service. Car hire is not essential in Kalkan as local transport is both plentiful and cheap but widely available if you choose to book in resort. All local tourist beauty spots are easily accessed. Located on the Turquoise coast of Turkey and with the soaring Taurus mountains as a backdrop lies the post card pretty village of Kalkan. The ancient sites of Xanthos, Letoon, Pinar, Tlos and Patara are within easy reach. Driving up into the mountains behind Kalkan and travelling through stunning scenery you will come across a fertile plain that was once a prehistoric lake. Amongst the fields and orchards is the old working village of Bezirgan. Kalkan is a small fishing village with winding cobbled streets which has expanded gradually over recent years. The ancient old town retains its original character. At its centre lies the harbour with a mix of local fishing craft traditional Gulets and visiting yachts. There are many superb restaurants for which Kalkan is most famous here you will find menus to suit all pockets and tastes. These are mainly situated along the harbour front or on roof terraces offering excellent views over the sea whist dining. Shops are very good quality with a range of good merchandise available from arts and crafts to designer handbags. There is an excellent weekly Thursday market providing opportunities for bargain hunting from T-shirts and jeans to spices and local produce. There are 3 banks with ATM's in the village. There is a small supermarket within 5 minutes walk from the apartment and other larger supermarkets, greengrocers and butchers within 7 to 10 minutes walk. Booking Notes: There is a non-refundable 25% deposit to secure your booking (minimum £150) the balance is payable no later than 8 weeks prior to departure as well as a £250 returnable breakages deposit. The breakages deposit will be returned after clearance with the local agent. No pets allowed. Smoking is not permitted. Local English speaking representatives are available to answer any questions for sorting any maintenance issues and emergencies. Changeover Day: Change over day is flexible depending upon our bookings.